Part of the Simply Stylish line of P-touch products, the PT-90 puts extra style into labeling! This customizable model offers 3 changeable faceplates to help personalize your labeler. Add up to 8 stylish patterns to your home labeling applications using the "Deco Mode" feature. 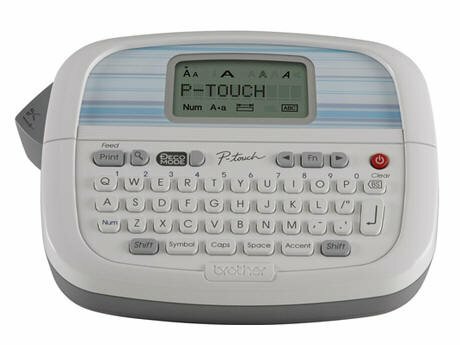 With its small, handheld design, the PT-90 fits perfectly in a bag for on-the-go labeling.Featuring an easy-view, 12-character LCD display and typewriter style keyboard, the PT-90 prints non-laminated labels in 3/8" & 1/2" widths. Easily design creative labels with 1 or 2 lines of text using one of the 9 Type Styles, 173 Symbols or 7 Framing options. Uses 4 "AAA" batteries (not included) and includes one Black on White "M" starter tape.